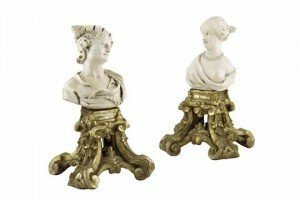 A pair of 19th century Italian ivory busts, of a gentleman and a lady, possibly Romeo and Juliet, mounted on carved gilt wood bases. 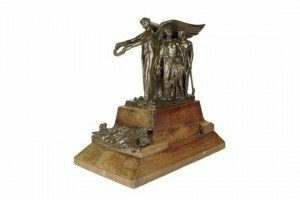 A French bronze maquette for a war memorial, depicting Victory protecting workers and families standing on a broken sword above a sleeping soldier, mounted on a cherrywood plinth base. 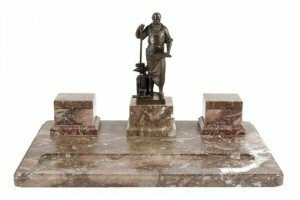 A large late 19th century continental pink marble desk stand, surmounted by a bronze model of a blacksmith by Otto Rasmussen, signed, with a pair of inkwells and a pen recess. A collection of three vintage 9 carat gold dress rings to include a garnet set ring and a pearl set ring. 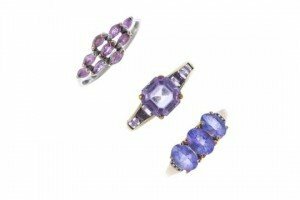 An 18 carat gold pink sapphire and diamond set dress ring, together with two other 9 carat gold gem set dress rings. 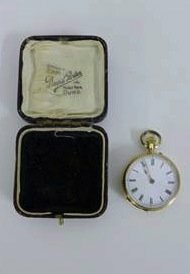 A 14 carat gold cased lady’s fob watch with foliate engraving, the circular enamel dial with Roman numerals. 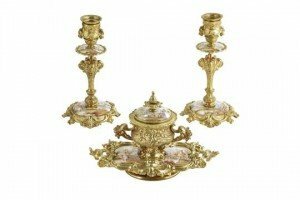 A late 19th century Viennese enamel and gilt brass desk set, painted with figures in garden and landscape settings, comprising: a pair of candlesticks and an inkwell with a lift-out ceramic liner. 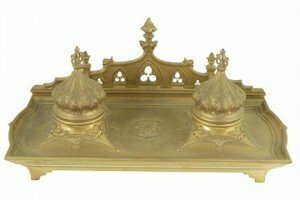 A 19th century French ormolu in Gothic style inkstand by Barbedienne, with a pair of hinged covers revealing blue glass inkwells. 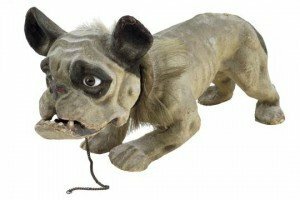 An early 20th century French papier-mache and felt model of a French bulldog, with glass eyes, nodding head and working growler lead on wooden castors. 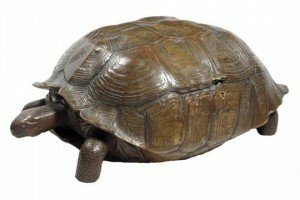 A rare late 19th century novelty carved oak tortoise tantalus, the real tortoise shell hinged to reveal a fitted interior with four cut glass decanters and six glasses, with glass eyes. 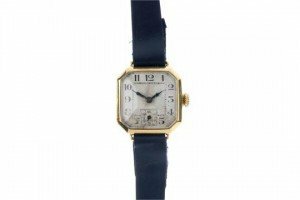 A mid 20th century lady’s wristwatch. The octagonal-shape dial, with black Arabic numerals, to the plain 18ct gold case and dark blue strap. An 18ct gold sapphire and diamond ring. 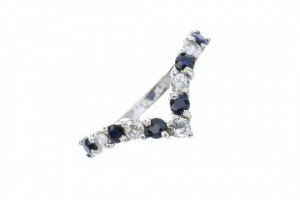 The alternating circular-shape sapphire and brilliant-cut diamond chevron, to the plain band. A selection of early 20th century jewellery. 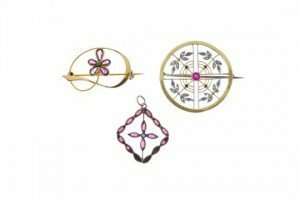 To include a ruby and diamond foliate target brooch, a green and purple paste pansy brooch, together with a 9ct gold split pearl and red gem kite-shape pendant. A 9ct gold aquamarine and diamond triple cluster ring. 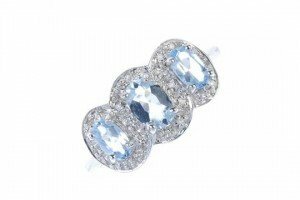 Comprising three graduated oval-shape aquamarines, each within a single-cut diamond shared surround, to the tapered shoulders and plain band. A selection of three 9ct gold gem-set rings. 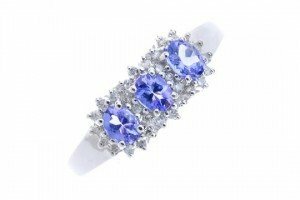 To include an oval-shape tanzanite three-stone ring, a square-shape amethyst ring and a marquise-shape pink sapphire cluster ring. 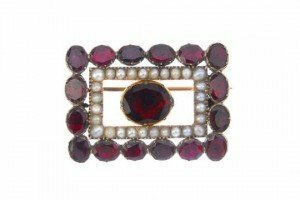 A garnet and split pearl brooch. The oval-shape foil back garnet, within a split pearl and oval-shape foil back garnet rectangular-shape double surround. A 9ct gold opal, emerald and diamond dress ring. 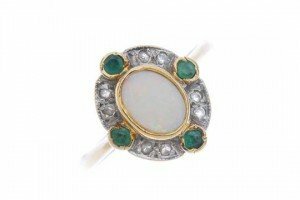 The oval opal cabochon, within a single-cut diamond and circular-shape emerald surround, to the tapered band. A 9ct gold tanzanite and diamond cluster ring. 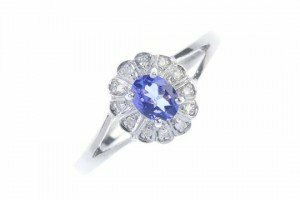 The oval-shape tanzanite within a single-cut diamond scalloped surround, to the bifurcated shoulders and plain band. 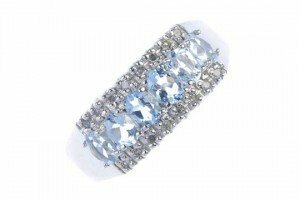 A 9ct gold aquamarine and diamond dress ring. The oval-shape aquamarine line, with single-cut diamond sides, to the tapered shoulders and plain band. A 9ct gold tanzanite and diamond triple cluster ring. The oval-shape tanzanite line, within a single-cut diamond shared surround, to the tapered shoulders and plain band.